Prior to 1954, the majority of the Minnesota Highway Patrol cars were black in color. From mid-1954 through 1957, the Highway Patrol purchased cars in all different colors. The logic behind it was that all of the patrol cars would blend in with other traffic. Thus, every vehicle could potentially be a Highway Patrol car which would cause people to mind their manners on the road. You never knew where a patrolman might be lurking. 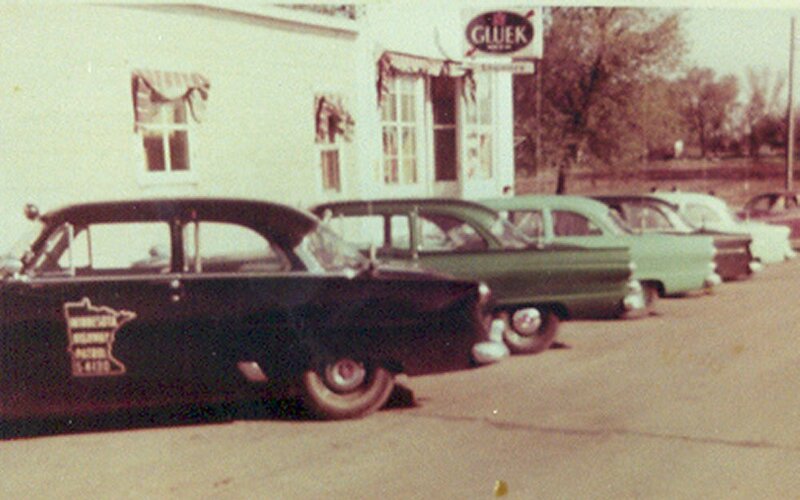 In the photo above, five 1954 and 1955 Ford patrol cars of various colors are parked in downtown Garvin, Minnesota. Below, the replica of Unit 54158 is pictured. The 1954 Ford Mainline was painstakingly restored in 2006-2007. It is owned by the Minnesota State Patrol Troopers Association and is available for displays, shows, city festivals and other events throughout Minnesota. Contact us here if you would like the vehicle displayed at your event.